Skills: Computer expert and hacker. He also has combat skills since he was in the military before losing his sight. Even without being able to see he can throw a few punches quite effectively. QUOTE: Some people call it a sixth sense. I like to call it a fifth, but that’s just me. I am not the biggest Covert Affairs fan, but I have no complaints about Auggie. Not only is he the most charming character on the show, but he is also the most competent. The fact that he is vision impaired doesn't stop him from being the best at what he does. He provides reliable support and Annie would have died 10 times already if it wasn't for him [not that that would bother me much]. Plus, he is super cute and eye candy is never a bad thing to have around. Skills: Hacker, engineer, he can also defend himself, not to the level of Michael or Nikita, but he can handle himself. QUOTE: If God is in the detail, then I am a God. One of the things I love about Nikita is that it is a show with a lot of humor. Nikita constantly delivers awesome one-liners and kicks as, usually at the same time. Besides her, the other source of constant comical relief is her techie Birkoff. He is probably the most entertaining character and one of the best techs/hackers. There is no computer system he can’t breech and he does it all while spreading sarcastic comments and endless snark. You gotta love the nerd. Skills: Chuck had an almost degree in Engineering from Stanford, he was a computer expert and he had a supercomputer in his brain. So he basically knew it ALL. QUOTE: Um… look Sarah. I never really fired a gun before OK? I… I’ve actually done this on purpose to avoid any unpleasant side-effects, like shooting myself… or others. Chuck… one of my favorite underrated shows of all times. Not enough people watched this incredibly funny parody of the spy world. The premise of a nerd becoming an international spy by accident says it all. The show was hilarious and original and it had SO many geek references and geek-friendly guest stars over the years including: Linda Hamilton, Kristin Kreuk, Brandon Routh, Summer Glau, Eric Roberts, Ray Wise and the list goes on. 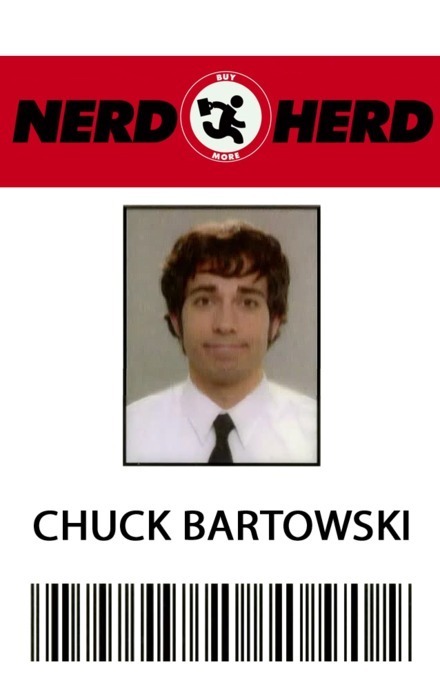 Chuck himself was the definition of a nerd; he even worked at the “Nerd Herd”. So, yeah… Chuck was a great techie, not so much spy [at least at the beginning], that’s why it was so much fun to watch. Good spy parodies are very hard to find and Chuck was one of the best characters in this genre. QUOTE: I may be blonde, but I am not that blonde. Felicity is without a doubt one of my favorite characters on TV. She stole the show from the minute she was introduced as the tech expert of Queen Industries. I was thrilled when she entered Oliver’s inner circle and she started having a more prominent role each week. I love to see a female techie and I love the fact that didn’t go with the stereotypical unattractive nerd type. Felicity is beautiful, smarter than anyone and totally cool. And my number one techie from all times is…. Skills: Designing awesome spy gadgets, hacking, chemistry, acoustics, photographic memory, mechanics, etc. He basically knew it all. Not even a contest. One of my favorite characters on one of my favorite shows of all times. I think Marshall set the bar for all the “techie” characters to come. He was so awkward and adorable and his relationship with Sydney was great to watch. Like all the other techs, Marshall had an incredible new gadget each week, but he was better than anyone else at introducing and explaining them. Probably the most memorable techie on TV. Yes! there was a string of comments that were totally amazing and she had the best way of delivering them with the right amount of innocence. I think Felicity is one of the best TV characters to come in a long while. I love the fact that she is a girl, I love that she is smart yet she's still insecure at times. Really really like her. What about Barnie from the original TV series Mission impossible? One of the earliest, coolest, chilled out techie characters, of colour by the way, that established what was to come. Simply the best.